Audible, who captured both the $1 million Florida Derby (G1) and $350,000 Holy Bull (G2), is the most prominent name on the list of nominations for the $100,000 Harlan's Holiday at Gulfstream Park Dec. 15. Trainer Todd Pletcher plans to use the 1 1/16-mile stakes as a steppingstone for a start in the $9 million Pegasus World Cup Invitational (G1) at Gulfstream Park Jan. 26. The Harlan's Holiday will be one of five graded-stakes on the Dec. 15 program that will serve as prep races for the $16 million Pegasus World Cup Championship Invitational Series, which includes the $7 million Pegasus World Cup Turf Invitational (G1), as well as seven other undercard stakes on the Jan. 26 program. 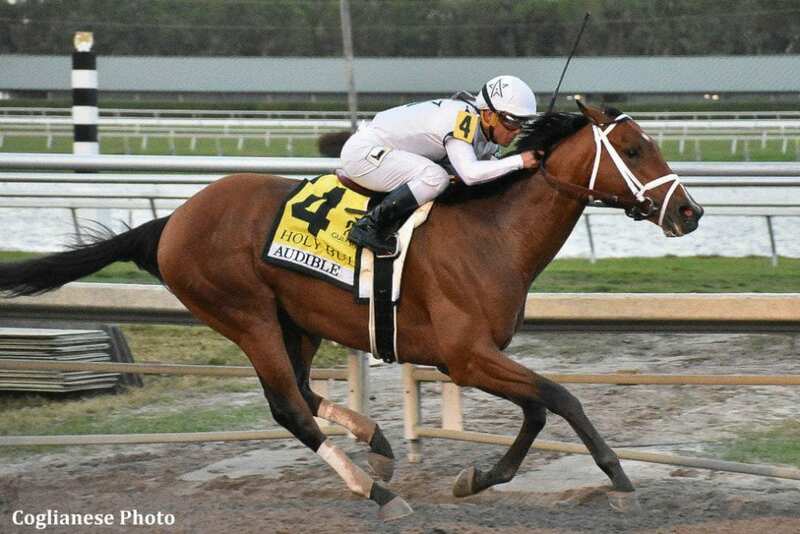 The Harlan's Holiday, which attracted 15 nominations, will be Audible's second start since his troubled third-place finish behind Justify in the Kentucky Derby (G1) May 5. Owned by China Horse Club International, WinStar Farm, Starlight Racing and Head of Plain Partners, the 3-year-old son of Into Mischief captured the seven-furlong Cherokee Run by two lengths on the Breeders' Cup undercard at Churchill Downs Nov. 3. Pletcher also nominated Bal Barbour, who has won his two most recent starts, an allowance at Keeneland and the off-the-turf Gio Ponti Stakes at Aqueduct; and Village King, a Group 1 winner in Argentina who recently won the off-the-turf Red Smith at Aqueduct. Conquest Big E, an impressive three-length winner over 2017 Kentucky Derby winner Always Dreaming in the Gulfstream Park Mile (G1) last season, is among the more prominent likely challengers. The Harlan's Holiday will headline a stakes card that will include the $200,000 Fort Lauderdale (G2), $100,000 Sugar Swirl (G3), $100,000 Rampart (G3) and $100,000 My Charmer (G3). This entry was posted in Pegasus World Cup and tagged 2019 pegasus world cup, audible, Florida horse racing, gulfstream park, harlan's holiday stakes, todd pletcher by Edited Press Release. Bookmark the permalink.